Hacker Group Fancy Bears has leaked documents obtained from Canadian winter sports federations, revealing that North American officials are among the fiercest agitators against Russia. In their latest leak, the hackers emphasized the fact that an independent investigation into alleged doping scheme in Russia was held by a Canadian lawyer, Richard McLaren, acting on behalf of the World Anti-Doping Agency (WADA), which is based in Montreal, Canada. The notorious report published in 2016 resulted in numerous sanctions against Russia, with an Olympic ban from the 2018 PyeongChang Winter Games being among the most recent penalties. 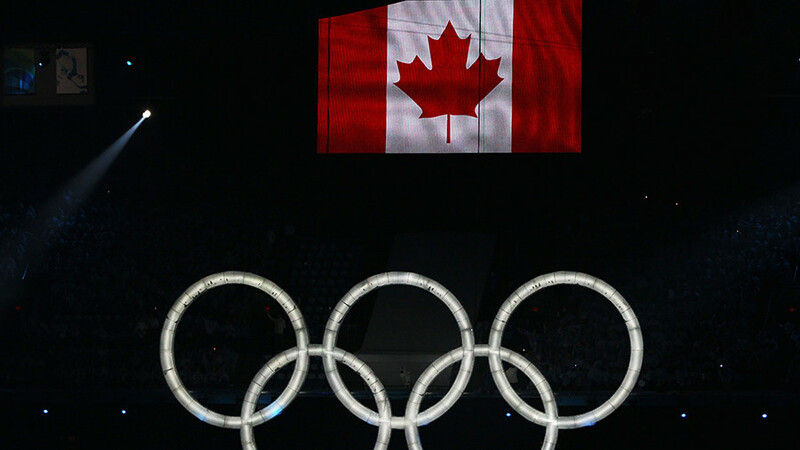 The emails published on the hacker group’s website show Canadian sports figures exerting pressure on the international sports federations in an attempt to toughen sanctions against Russia. 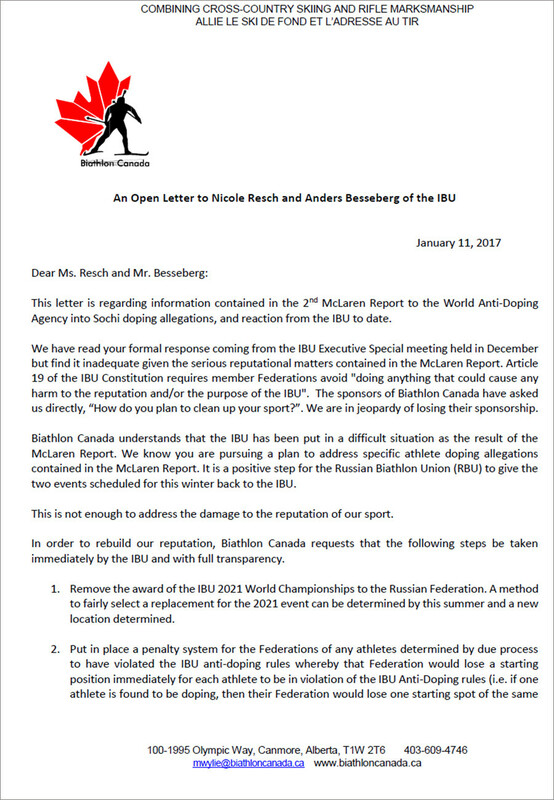 The letter dated by January 11, 2017, shows President of Biathlon Canada, Murray Wylie, addressing to the International Biathlon Union (IBU) senior executives, expressing his disappointment over the body’s mild position on Russia, following the publication of the second McLaren report. According to the document, Wylie said that actions taken by the IBU were “not enough to address the damage to the reputation of our sport” adding that Biathlon Canada risked losing its sponsors because of the doping scandal. “The sponsors of Biathlon Canada have asked us directly ‘How do you plan to clean up your sport?’” he is quoted as saying. Wylie is then shown requesting the IBU to take a tougher stance on Russian alleged doping violations, asking for implementation of strict penalty measures for federations and removal of the 2021 world championship from Russia. 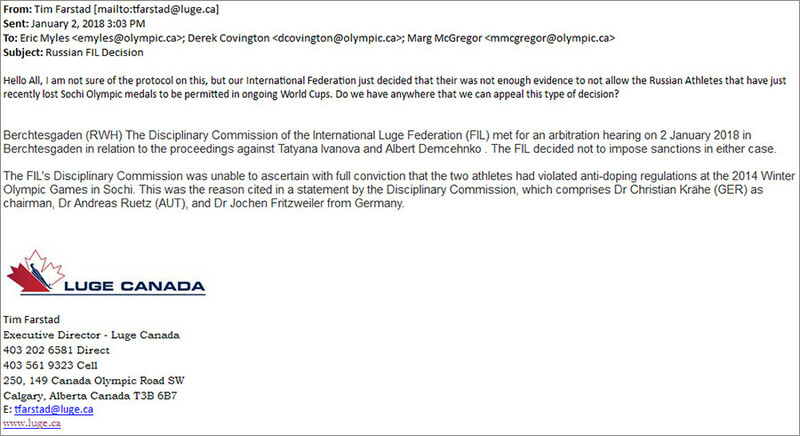 A second letter published by the Fancy Bears shows Executive Director of Canadian Luge Association, Tim Farstad, contacting several International Olympic Committee (IOC) members asking to provide him with information as to where the FIL’s decision might be appealed. The McLaren report findings have already been doubted by the Court of Arbitration for Sport (CAS), which cleared number of Russian athletes and dropped their life-bans over alleged doping violations, stating that the evidence against them was “insufficient” to determine any doping violation. The IOC which had handed the bans to the Russian athletes, however refused to invite them to the 2018 PyeongChang Games, despite all the doping charges against them had been dropped by the CAS.